For more about Trektember, read our preview post. Please note that there are minor plot spoilers for this episode below. 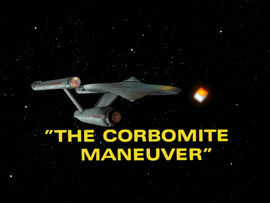 Today’s episode is Dr. McCoy’s introduction to the Trek universe, The Corbomite Maneuver. The Enterprise is halted by a tiny, mysterious glowing probe launched by the Fesarius, a massive vessel of the First Federation. Commander Balok of the Fesarius threatens the Enterprise with destruction, and the crew scrambles to find a way to escape his incredible technology. Kirk’s solution is to bluff the opposing captain – but Balok may have a bluff of his own. Being the plaything of a stronger power is a humiliating experience. The more inscrutable & powerful something is, the more terrifying it is. The entire crew experiences the fear of entrapment & the loss of control as the Fesarius holds them in place and issues threats to them. The fear of the unknown is a fear that drives or peppers every episode of Star Trek, but it meets a particularly sublime start here. What does this episode tell us about God or about man? Balok and the Fesarius demand the crew’s obedience and, in a way, their devotion. They command it through fear and back that fear up with what appears to be unlimited power. Bailey is so paralyzed with fear that he forgets his training and has to be relieved of duty. But the things we fear are not all-powerful, if they are not the Creator of the universe. They are weak and flawed; they are poor imitations of the true God. They demand our obedience, but they are not what they seem, and they do not deserve it. Their bluff is a mere trick, and we don’t have to fall for it. We value your comments and interaction on every post at Redeeming Culture, but make sure you check out the stellar comment by Tim below! This entry was posted in Star Trek and tagged Star Trek, The Original Series, Trektember, Trektember 2016. Bookmark the permalink. Captain to crew….You know the greatest danger facing us is ourselves, an irrational fear of the unknown. But there’s no such thing as the unknown, only things temporarily hidden, temporarily not understood. In most cases we have found that intelligence capable of a civilization is capable of understanding peaceful gestures. Surely a lifeform advanced enough for space travel is advanced enough to eventually understand our motives. All decks stand by. Captain out. So much in there. First, there is rank modernity: “no such thing as the unknown, only things temporarily hidden.” Brash belief that science will lead us to all truth. And his statement that “the greatest danger facing us is ourselves, an irrational fear of the unknown” is the application of that belief. Second, Roddenberry’s unyielding optimism shines through. We’ve found that “intelligence capable of a civilization is capable of understanding peaceful gestures. Surely a lifeform advanced enough for space travel is advanced enough to eventually understand our motives.” If we’re nice, surely they’ll be nice back. Can’t speak for other species, but that, tragically, has not been the case here on Earth. KIRK: What’s the matter with them out there? They must know we mean them no harm. SPOCK: They’re certainly aware by now that we’re totally incapable of it. KIRK: There must be something to do, something I’ve overlooked. In the end, his belief in the basic goodness of intelligent life lets him down so he resorts to deception, or a bluff. That kind of proves that the assumed goodness of intelligence is a false hope. While deception or ‘bluffing’ is not a bad as destroying someone, it is still wrong. Thanks for prompting some reflection on this episode! It was better than I remembered it. I’m looking forward to working through the rest of the episodes with you! Wow, that’s an awesome addendum. Thanks for that! I have to say, I often disregard overt mentions of religion or spirituality in stories as the “low-hanging fruit,” but this comment is a great example of how even the overt mentions of God or gods can be helpful in seeing what God has put into our hearts and how He has written His story into what we love. Great comment. Thanks so much. Glad to have you along! This has been called revolutionary thinking. Apparently it wasn’t credible until science himself said it.